We've been playing BioShock Infinite, but we can't tell you about it just yet. In order to get our early copy, we agreed to stick to the embargo set by publisher 2K Games, which is up on Monday. 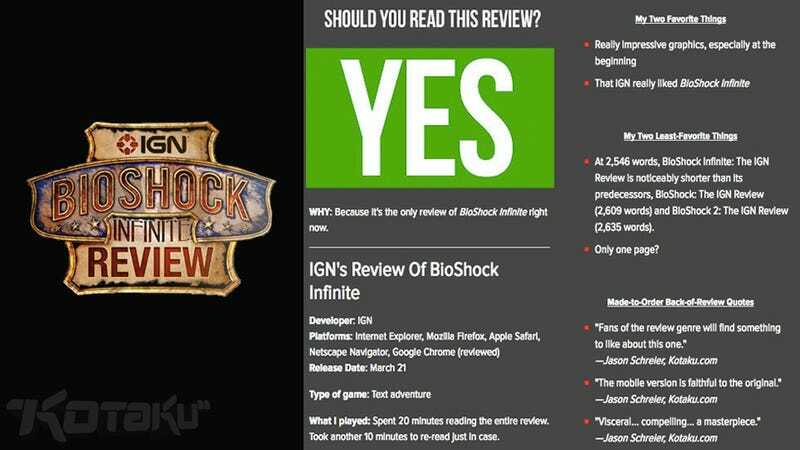 But we can tell you about IGN's exclusive review of BioShock Infinite, which went live tonight. So above you can find our Official Kotaku Review* of their review. *Warning: review may not be an Official Kotaku Review. Kotaku holds no responsibility for any damages that may occur to anyone thinking that this is an Official Kotaku Review.